Disinfectant is a liquid used to destroy and kill unwanted germs and parasites. It is often used in the activity of cleaning, especially in bathrooms and kitchens, as they are the areas most likely to be contaminated with dangerous microorganisms. 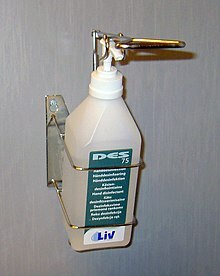 Disinfectant is a dangerous liquid and should be used carefully because it can be deadly to humans and animals when in large amounts; it is also different to antiseptics for this reason - disinfectants can only be used on non-living things, while antiseptics are not strong enough to combat the germs a disinfectant fights. This page was last changed on 31 March 2014, at 19:44.